Looking for the secret to fast, sturdy and stunning seams? Look no further than the H|CLASS™ 200S overlock machine by HUSQVARNA VIKING®. Impressive speed. Intuitive threading. Incredible results. Trim the edges, stitch seams and overcast in one-step. Fast sewing with professional results. No more frayed edges or puckered seams. Electronic speed control: Stitch-by-stitch control with full piercing power at all speeds. Sews up to 1300 stitches per minute. Easy threading: Front covers open completely to reveal loopers for great visibility and ease of threading. Lay-in tension and color-coded thread paths. Automatic thread tension release allows you to pull threads when presser foot is up for easy removal of the fabric. Integrated adjustable edge guide helps to keep the fabric straight for selected seam allowances. Extra presser foot height makes it easy to sew several layers or heavy fabrics. Built-in thread cutter conveniently located to trim your thread chain near the end of the fabric. Recessed cutter, mounted from below, to provide greater visibility and make fabric maneuvering easier. Waste tray to keep the sewing area neat. Snap-on presser foot system makes it easy to change to optional feet for specialty techniques. Accessories at your fingertips thanks to the built-in accessory compartment. 4, 3 and 2 thread sewing for utility and decorative overlock sewing. 12 stitches. 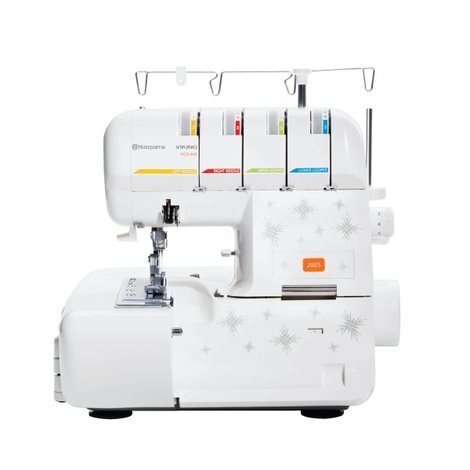 The overlock machine has the right stitch for all kinds of fabrics. Instant rolled edges. No need to change either the presser foot or stitch plate. Differential feed eliminates stretching of knit fabrics and puckering of lightweight fabrics. Can also be used for automatic gathering. Adjustable stitch length, cutting width and presser foot pressure. Select best stitch length and fine-tune width for sturdy seams and flat smooth stitches on all fabrics. Specially developed EL needles to give you great stitch results even at high speed. Two-thread converter, Stitch finger B, Brush, Screw driver (small), Screw driver (large), Oiler, Extra cutter, Wrench, Thread nets, Tweezers, Spool disc, Spool holder, Spool cap (on machine), Accessory bag, Lint tray, Vinyl dust cover, Needle pack - including three needles, size #14/90 and two needles, size #12/80 (INSPIRA™ system ELx705). Two needles, size #14/90, are in the machine on delivery.